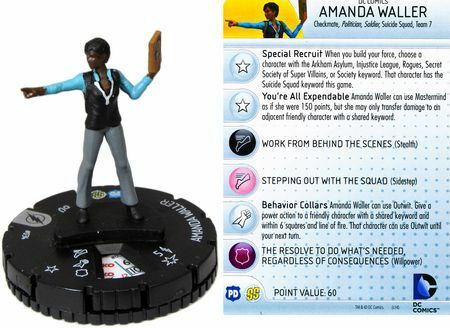 Its model number and name are #012 / Amanda Waller. Q: When a figure like Gentlemen Ghost has a Suicide Marker on its card and is destroyed when the X Order Marker is revealed on Waller's card, which player controls the card going forward? A: The order of events is first the switching of sides, followed by Waller revealing the X to destroy the figure, thus the Gentleman Ghost card is still handed over to the opponent before the figure is removed from play. As a Human, Amanda Waller has these Human Synergies. Amanda Waller may choose Unique Criminal, Outlaw, Rogue, and Thief Heroes for her Suicide Squad special power, activate them with her Director of A.R.G.U.S. special power, and boost them with her Special Assignment special power. Current Criminals, Outlaws, Rogues, and Thieves. Amanda Waller may activate Agents with her Director of A.R.G.U.S. special power and boost them with her Special Assignment special power. Current Agents. As a Human, Amanda Waller interacts differently with these special powers. If an opponent would take temporary or permanent control of a figure with one of Amanda Waller's Micro-Bomb Markers on its card, Amanda Waller may use her Suicide Squad special power to destroy that figure. Current Special Powers that take Temporary or Permanent Control. Amanda Waller works well with the The S.H.I.E.L.D. Agents common squad as her Special Assignment Special Power allows her to boost their attack by 1, while the Director of A.R.G.U.S. Special Power lets you activate them when they are best positioned to take advantage of the attack boost. Three ranged attacks that are boosted can often be a better option than taking a turn with two of your Suicide Squad members, depending on who you have left. Initial playtest: Yodaking - failed, Viegon tests, YK Retests + Additional Test. Last edited by Ronin; September 2nd, 2018 at 06:31 PM. Reason: fixed links. At the start of the game, choose up to 6 Unique Heroes you control with the class of Criminal, Outlaw, Rogue, or Thief and place a black Micro-Bomb Marker on each of their cards. After taking a turn with a figure that has one of your Micro-Bomb Markers on its card, you must roll the 20-sided die. If you roll 2 or lower, remove any Order Markers on that figure's Army Card and choose an opponent to take control of that figure and its card. If an opponent would take temporary or permanent control of a figure you control with a Micro-Bomb Marker on its card, you may immediately reveal an "X" Order Marker on this card to destroy that figure. Before rolling for initiative each round, you may choose an opponent's Unique Hero on the battlefield. For the duration of the round, any figure you control taking a turn with Director of A.R.G.U.S. rolls 1 additional die when attacking the chosen figure. After revealing a numbered Order Marker on this card, instead of taking a turn with Amanda Waller, you may take a turn with up to two Heroes you control with Micro-Bomb Markers on their cards or one Agent Hero or Squad you control. There are two minis to choose from. I personally like the skinnier one but I think the other one is more comic accurate. The 2nd one is also more available and thus may be easier to get pics of. Which mini we choose will play into the comic art selection. Hoping to see what @quozl thinks of this one, since she was his draft! - 100% in favor of the older, heftier Waller. It's the most iconic version of the character. - Just call them IED Markers; you can explain the abbreviation in the bio. Would read a lot more cleanly. - I'd like to see the destruction be A) optional and B) trigger on any transfer of control. With permanent control you'd blow them up 90% of the time anyways, and with temporary you could either wait it out or prevent a catastrophic switch. Plus, I could easily see Waller leaving someone like the Creeper alive if it suited her needs. - I'd like to see more to Behind the Curtain than just a die-roll. Have it more along the lines of Lex Luthor's power. Contingent on there being other units to deflect attention. - Not sure on Class/Personality here but I can't think of any good alternatives right now. I'll think on it. One question, though - should there be a limit beyond species? I know that Suicide Squad is GENERALLY Criminals, Thieves, and other ne'er-do-wells, but is it unthematic to have law-abiding citizens on the team? When an opponent would take control of a figure you control with your IED Marker on its card, you may destroy that figure. 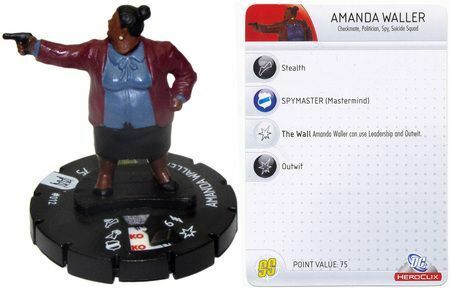 When Amanda Waller is destroyed, you must destroy one figure you control with your IED Marker on its card for each unrevealed Order Marker on this card. What I like about this change is that you don't have to destroy them unless Amanda Waller is destroyed. I also like adding the choice of destroying them when someone would take temporary control of them. I guess I can see her choosing not to blow someone up just because they switched teams if she thought she could still get them to switch back or if they somehow hurt the other team. After the 24 hours have passed I'll try a rewrite and see how it works. *edit* Actually quozl's rewording works for me. Your thoughts on Behind the Curtain seem spot on too, keeping at least one figure close by to deflect the attention may keep you from just leaving her in the start zone for the whole game. 1) Personally, I'm not huge on Waller turning your team into the Suicide Squad. Correct me if I'm wrong, but I thought the Suicide Squad was comprised of villains who'd been captured by ARGUS and forced into it. If that's correct, I think the more thematic way of doing it would be to allow Waller to turn your opponent's heroes into Suicide Squad members when you would destroy them (as in, you take control of them instead of placing the killing wounds). When an opponent would take temporary or permanent control of a figure you control, you may reveal and remove an "X" Order Marker from this card to destroy that figure. 3) I'd like her to be a leader for Agents in addition to her Suicide Squad/Task Force X powers; if an ARGUS squad gets made, they'll most likely be Agents and Waller should totally be able to command them around. 4) I'm not completely sold on Behind the Curtain. I like the theme you're going for with it, but I don't think it translates well; as it's currently written, it feels like some sort of cloaking or illusion power. Plus I'm not sure its needed. You'll already be leaving her in the back of your base, which gets that feel of managing from a distance while also protecting her against most opponents. As to this question, based on her personality I think if she could somehow get her hands on 'good' super people she would not hesitate to bring them under her control and use them for her own purposes. Kind of like how she is running Oliver right now in Arrow, their is no bomb implanted in his head but she is strong arming him none the less. I also think trying to limit it to only 'bad people' would be difficult. Their are just so many different classes in play. Here is the current list for the markers as the power is written right now. There are several humans that are not good fits thematically, Gordon, Alfred, J. J. Jameson, Wong, etc. but most of those are also not really good options from a game play perspective either so I doubt she would be paired up with them. The future ARGUS Agents is a good point, I think we can work that into the strategic management power. Maybe take a turn with two IED figures or 1 IED figure and one agent hero or squad you control? I'm with Viegon on not really seeing the need for Behind the Curtain. You're going to want to protect her anyways and I think it will allow for some more interesting strategic choices of how to play her than with that power. The rest looks good with the suggestions they others have already brought forward. I also think trying to limit it to only 'bad people' would be difficult. Their are just so many different classes in play. This is why I prefer her turning your opponent's heroes into the Suicide Squad. There isn't a synergy group that accurately gets the theme. Even with the current one, it leaves out characters like King Shark who should be on it, while it includes plenty of units it shouldn't. By turning enemy heroes into the Suicide Squad, it captures the core theme of her using her enemies as a weapon. I think Viegon's on to something interesting here! Maybe something like this? Start the game with 6 white IED Markers on this card. Whenever an enemy figure would be destroyed, you may place an IED Marker from this card on that figure's Army Card. Do not place any wound markers on the affected figure's Army Card. Remove all Order Markers from the affected figures Army Card and take permanent control of that figure and its Army Card. When an opponent takes permanent control of a figure you controlled with the IED Marker on their card, you may destroy that figure instead. When Amanda Waller is destroyed, also destroy one figure you control with an IED Marker on their card for each unrevealed Order Marker on this card. The wording needs tightening, but you get the gist. Then give her an Agent synergy power to go with it.